Assessing Fitness to Practice: what test must the GDC satisfy? There is a feeling amongst dentists on forums such as this that the GDC has become too heavy handed when dealing with alleged misconduct cases. In March 2017 alone, of the 29 misconduct Fitness to Practice cases heard by the GDC, 9 dental professionals were suspended, 4 had conditions placed on them, 4 were erased and 2 were reprimanded. There were also 4 cases with the outcome still pending. That means of the 25 cases concluded 76% of dental professionals were found to have committed misconduct. Compare this with the GMC figures for the same month, there were only 6 misconduct Fitness to Practice cases of which only 2 had findings of impairment made against the doctor. Considering there are more doctors than dental professionals registered to practice in the UK, the difference is significant. In November 2016 the GDC introduced Case Examiners in an attempt to help streamline the Fitness to Practice process. Their role is to consider whether a referral should be made to the Practice Committee. Given this new stage is still in its infancy, we are yet to see what impact this will have on misconduct cases within the dental profession. However, it is hoped that as cases will be considered by a lay member and a dental professional, a more proactive approach will be taken at an early stage. This is the approach taken by the GMC and the low numbers of misconduct cases being referred for hearings could be a positive sign of things to come. Unfortunately there are rarely any consequences for patients who make spurious complaints which are not upheld; however, the same cannot be said for the professional. The time, stress and expense of misconduct hearings can have a devastating effect. Many feel that their stress is exacerbated by an unsympathetic and heavy handed regulator. If you are facing a misconduct investigation, it will no doubt be a worrying period for you. It is important to understand from the outset what legal test the GDC will be applying. This way you can properly prepare your defence and gather evidence from an early stage. Proper presentation at the start may well ensure that the Case Examiner determines that a case should be closed at an early stage. If the case should proceed to a hearing you will be armed with the necessary knowledge to put forward the best possible defence, which in turn could help with any later appeals to the High Court. What test does the Professional Conduct Committee (PCC) apply when assessing Fitness to Practice? 1. Has misconduct taken place? 2. Is the dentist’s fitness to practice impaired? Whether or not misconduct has occurred will depend on the allegations raised and the evidence produced and as such this element of the test will be fact sensitive. The PCC must decide whether ‘it is more likely than not’ that the allegations took place, which unfortunately is a relatively low threshold. However, even if any of the allegations are found to be proved, case law has established that the conduct must be ‘serious’ before moving to the next stage of the test. Tip. Is this a potential area that can be challenged? Are you able to obtain evidence or refer to previous cases that show the misconduct is not serious and therefore no further action should be taken? When considering if a dentist’s fitness to practice is impaired, the PCC should look at the dentist’s current fitness to practice? It will not be sufficient to show historic impairment, unless the misconduct is so grave as to warrant it. It should be noted that impairment is not assessed against any established standards of proof; it is a matter of judgment for the PCC committee. However, a failure to comply with the fundamental standards laid out in the ‘Standards for Dental Professionals’ is likely to lead to a finding of impairment. Tip. 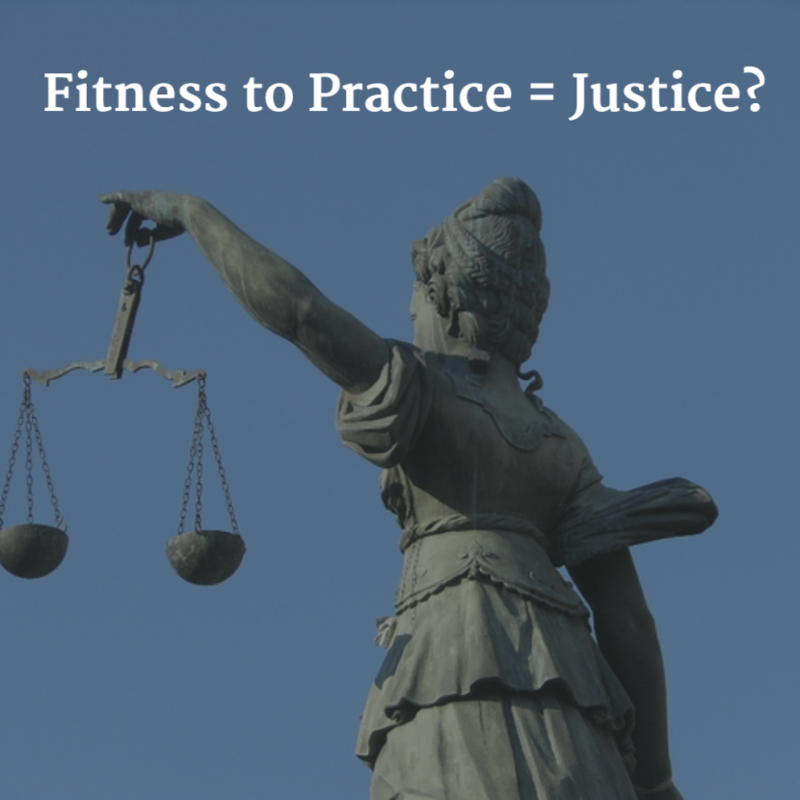 Even if you do not accept the allegations against you, you should consider what actions you can undertake to show your fitness to practice is not impaired. For example, attending training courses, amending your policies and procedures, or being mentored/shadowing another dental professional. This should not be seen as an admission of guilt but a recognition that professionals can always seek to improve. In deciding what sanctions to impose, the PCC must apply the principle of proportionality by weighing the interests of the public against those of the dentist. Tip. This is where you need to put forward your mitigating circumstances so as to reduce the sanction imposed. Also you are allowed to suggest out what sanctions should be imposed and if you are able to give the PCC well thought-out sanctions bearing in mind the allegations, this could prevent erasure or suspension. When the GDC receives a complaint, it first considers if it is the correct body to deal with it. If so, it will obtain more information from the complainant to assess whether one of the ‘Standards for Dental Professionals’ may have been breached. It is important to note that the Case Assessors do not make any findings of fact. 3. If the complaint is about dental treatment, the patient’s medical records. Tip. At this stage do not provide any further information than the above. Whilst it will be tempting to explain what has happened, at this stage the GDC has not set out what the allegations are against you, so you do not know what you are responding to. Any statement given could later be used against you. If the Case Assessors consider a dentist’s fitness to practice may be impaired the case is referred to the Case Examiners; the case will be considered by one lay person and one professional. At this stage you will be sent details of the specific allegations against you and it is at this stage you will be asked to respond. The Case Examiners are not making findings of fact. Their role is to consider whether there is sufficient information to make a referral to the Practice Committee. Tip 1. If the allegations are not clear, seek clarification. If evidence is referred to, ask for copies of that evidence. Tip 2. Whilst the Case Examiners are not determining the case, if you can show there was no misconduct, we would recommend responding fully to the allegations and providing evidence to support your assertions. However, if you think there may be a case against you on the evidence received think very carefully before making any admissions at this early stage. It may well be worth seeing the extent of the case against you before admitting any wrong doing. · What evidence do you need to rebut the allegations? · Are you able to show the misconduct is not serious? · What have you done to show your fitness is not impaired? · Will other dentists/patients provide statements as to your character? · What mitigating circumstances are there? · What sanctions should be imposed? Tip. If you are not happy with the GDC’s decision you have the right to appeal to the High Court within 28 days. We set out the circumstances when you can appeal in Issue 2 of our dental bulletin. ‘misconduct is a word of general effect, involving some act or omission which falls short of what would be proper in the circumstances. The standard of propriety may often be found by reference to the rules and standards ordinarily required to be followed by a medical practitioner in the particular circumstances’. that "misconduct" – now one of the categories of impairment of fitness to practise…..
drinking out of a glass left in the surgery. Observe how it is kept to one side of A4, extremely succinct, and there is nothing in it that may give any third party reading it anything to chuckle about? I also noted the lack of any published charges before the hearing for the sum total of 3 barristers presently listed as awaiting a hearing. This, along with the MPTS hearings begs the question of why does our regulator operate on a different set of rules that on the face of it appear more punitive to their registrants than those applied to equivalent professionals? Although it may give me nothing to write about, I would really urge the GDC to look at paring down their charge sheets and not making them public until after the facts have been determined in both their interests and those of the registrants facing a hearing. adequately treat an on-going adverse oral hygiene condition. It may just be me, but I can’t work out what this charge is supposed to mean and there is no explanation in the determination. In 17 years of practise I have not been aware I was obliged to ‘treat’ an adverse oral hygiene condition; I was taught that my duty was to offer appropriate preventative advice and oral hygiene instruction. It is, I believe, the patient’s duty to ‘treat their oral hygiene condition’ and I can think of at least one periodontist who would take issue with this allegation. I am not sure how anyone can ‘treat an adverse oral hygiene condition’ save for pitching up at the patients house a couple of times a day and doing the cleaning for them, or bringing them to the surgery daily to see the hygienist. Nevertheless, as is often the case with these hearings, we are made to feel that we have been doing it wrong all along, and nobody bothered to tell us until a hearing. and even: the justification for not taking radiographs. &apos;Nowhere. However Clinical Audit 8. The employer’s procedures shall include provision for the carrying out of clinical audit as appropriate. and The written procedures for medical exposures shall include— (e)procedures to ensure that quality assurance programmes are followed; Thus it is incumbent to occasionally review image quality, patient dose and clinical relevance, and since there is no other means of assuring the quality of the next image, it is important to check the quality of each image and resolve any anomalies before taking the next one. It can be argued that in order for audit to be properly objective, there should be no contemporaneous written assessment of quality: you audit by picking past images at random and assessing them "cold"&apos;. You should therefore record any faults or failures that demand corrective action, to provide an audit trail for that action, but images deemed acceptable should be filed without comment in order not to prejudice the audit. Interesting stuff. I am baffled as to why anyone should be criticised for not recording an intellectual process. It is also clear that we do not have to record a grade in the clinical record, in fact we do not even have to grade every radiograph it seems, just check that the quality is acceptable in preparation for the next exposure and do an audit from time to time. So not only do we face issues with the bar of misconduct being stealthily raised, we are now also being tried and tested on doing things that are not actually required of us. This is why every registrant should be represented at a hearing in my opinion, and should only agree to charges that are indefensible. To admit to a frivolous or spurious charge purely to be seen to be ‘showing insight’ is not a position registrant should ever be put in, but I sadly suspect that is where we presently are. It was last October I recall that the issue of guidelines and misappropriate use was raised by Dental Protection. This, along with the ‘gold standard bar’ really means that too many registrants are having their careers put on the line when there is a lack of clarity over where the threshold for misconduct really sits, and no universally agreed clinical guidelines. I remain in hope that the GDC FtP department is looking at this closely in the pursuit of proportionate regulation. Moving on to some other cases, in the High Court, a registrant erased earlier in the year was successful in having his case remitted back to the PCC for reconsideration of an erasure. The registrant had got himself in to bother that might have been avoided by having to reapply to the register after his direct debit had failed, and was found to have been dishonest by fudging responses over two convictions for driving whilst under the influence of alcohol. It was held that the PCC had failed to consider relevant mitigating circumstances, namely that the employer had been informed of the convictions but the appeal failed on the challenge of the findings of dishonesty. You can find the judgement here. Another noteworthy case involved a newly qualified dentist who wound up at an FtP hearing based on performance issues that arose within months of qualification. The question that I am sure on everyone’s minds is ‘how could this happen when the GDC-accredited dental school have allowed him to pass finals?’. Nevertheless, it is nice to see that whilst the GDC-instructed barrister recommended he should be given a reprimand for being let out of dental school too early, there was good evidence of remediation so no current impairment was found. The chap has now completed his VT year and is understandably ‘elated’. I’ll leave it here for now. My dog is barking to go out. Duty calls…. My understanding is that the GDC do not agree with the criticism that too high a standard is being applied in FtP hearings. As it happens, last month I was asked by a colleague for some concrete examples of use of the ‘gold standard’ by expert witnesses, so I went specifically looking for it in my review of June’s FtP hearings. June kicked off with a performance review hearing of a plethora of clinical issues involving a non-engaging registrant who had neither attended nor provided any representation at either hearing, which is always a bad move in my opinion. The case was initially heard in May 2015. Professor Morganstein was instructed by the GDC in this case, and is still according to Google the Dean of Dentistry of the University of Buckingham Dental School that I’m not sure has any dental students. There was a fair amount of criticism in the charges levied at instances of alleged failed treatment and inadequate discussions which the panel did not find proved, and when an allegation that the registrant had provided inadequate care by not giving a patient with an orthodontic retainer specific advice on using a fluoride mouthwash, tooth brushing and reducing sugar consumption the determination states that the Committee considered the expert had applied the gold standard rather than that of the reasonable dentist. This registrant was initially suspended for 12 months and then a further 12 months at the review hearing. The panel had no other choice due to the lack of engagement and attendance in the process and had there been any evidence of insight and remediation the registrant may well have been able to continue practising under conditions. It has been demonstrated in a paper written by Professor Kevin Dalton that registrants who do not attend their hearing and are unrepresented face a significantly higher risk of a high sanction being imposed than those who attend or are represented. In another review case heard this month the GDC-appointed expert was found by the Committee to appear to be ‘applying a ‘gold standard’ with respect to the diagnostic quality of the radiographs’ at the initial hearing in January 2015. The lesson here is that coned off radiographs are not necessarily poorly-positioned if it is possible to get adequate diagnostic information from them. There is also reference to not recording LA batch numbers and expiry dates in this case which another ‘gold standard’ recording is keeping requirement at best. Next up a Committee was of the opinion that: ‘in some cases, Mr Expert was advocating a ‘gold standard’. Not recording dietary advice provided (the patient was caries-free). So there are three cases here providing some evidence that the gold standard is/was being used (and being identified by Committees) in a sample of new and review hearings held only during June 2016. 3 cases of no misconduct/facts found proved do not amount to misconduct. Per registrant type there were 46 dentists, 7 dental nurses, 11 technicians and 2 clinical dental technicians involved in hearings this month. June was a bit bare on any interesting charges such as bouncing balls of impression material in corridors, bringing children to work or having untidy hair. However there were a high number of erasures that month, and dental technicians brought in front of a PC or IOC for acting out of scope in June also featured quite heavily. Working as a hygienist when registered as a dental nurse, plus dishonest behaviour relating to a lack of indemnity and misleading behaviour relating to website material. With regard to the technicians, pretty much all of these cases related to acting beyond scope; taking impressions when not trained to do so and working without a prescription. This is clearly an area that the GDC are tackling very proactively. By failing to inform the staff at the practice about the letter, the team members were not treated fairly and with dignity. It is worth noting that Dental Protection had provided guidance and advice on this letter before it was sent, and the registrant had not discussed it with the staff in order to protect the integrity of the investigation, yet the case still progressed. The patients ought to have been told why their consent was being sought to hand over copies of their records in my view. So all in all, it appears to me that someone who fulfilled their professional duty to raise a concern and assist in an investigation found themselves on the wrong end of the FtP process by way of thanks. It is not clear to me what the GDC hoped to achieve by bringing this case, and how this will encourage or protect those who may need to raise concerns in the future. Can we make the Regulators serve the Public and the Profession in foro conscientiae (the court of the conscience), rather than just a notion of what the regulations might say? I have attended and been asked to make some input into a variety of cases recently involving several different Regulators. It has become clear that there is a real danger that rules and regulations which may have been drafted for the protection of the Public and the guidance of the Profession are sometimes widely misinterpreted at best and occasionally deliberately corrupted and applied at worst. Whilst it might be considered that most regulation has been drafted to improve standards and reduce the risk of poor practice continuing; it is quite obvious that it can be applied in a manner to exert control or ‘manage’ the Profession. Sometimes this may occur deliberately and because it broadly serves the purpose of a government administration, it is allowed to continue at least as long as it serves a purpose. Sometimes it occurs at a much lower level and whilst not serving any particular purpose, it is allowed to continue because there is nobody at that level who is prepared to question it. I’ve got nothing against shop assistants, however I wouldn’t be wanting them to draft the GDC Charge Sheet which might end a Professional career. There is a high turnover of staff at the GDC which I suggest leads to a poor understanding and there appears to be a low level of dental knowledge. One of the cases to which I refer involved a young colleague, and for whom funds were raised at very short notice thanks to the excellent GDPUK membership. If you read the Charge Sheet, you would be forgiven in believing this dentist was a real danger to the Public. However I’m sure that you will all remember me reminding you to read between the lines whenever you are dealing with a Regulator. That is certainly necessary in this case. (iii) Fitted an inadequate post which was a) short of the apex, b) not extending to the apical third and c) was inadequate in width. (The post was temporary and deemed too wide). If the Charge sheet is a nonsense, the solution is simple. The Panel changes it, strikes it out or substitutes different wording. In other words, it moves the goalposts. The Panel, which is independent by hearing both parties then asks its own questions of the witnesses. It is advised by experts and can choose which expert it ‘prefers’. The expert appearing on behalf of a registrant might then be warned by the Prosecution barrister that the GDC may take action against them. The prosecuting barrister is instructed by the GDC and regularly prompted by their expert witness. In one of the cases to which I refer, four patient witnesses who had made a complaint were called. One of the witnesses was travelling to London and it was found that she intended to speak in favour of the Defendant and it was agreed therefore that this patient would not be heard. The Panel seemed to have some ability to read between the lines, but in the end ‘prefers’ the testimony of two patients. One of these patients produces a hand annotated diary of the treatment dates containing some dates that the defendant was actually not in the practice (a screen shot of practice diary was produced as evidence). The patient was receiving treatment from more than one dentist at two different practices simultaneously, but on the ‘balance of probability’ is to be believed. This patient was heard to say that she was seeking ‘redress’ on at least four occasions. Our young colleague describes how he always uses rubber dam for RCT and yet on his last day in the practice he finds there is no rubber dam available. He admits that on this single solitary occasion, rubber dam was not used. The patient has pleaded that a temporary post crown be placed (the same inadequate temporary post that was short of the apex) and he accedes to the request of RCT and temporary post, since the broken tooth was within the patients smile. He uses rotary RCT instrumentation, floss on hand instruments and high volume aspiration. The patient is the same one who was not given the opportunity to give further evidence in support or denial of the registrant. Our young colleague is guilty therefore of serious clinical failures and therefore misconduct. Another patient gives evidence about never having received treatment he has paid for, but the Panel agrees that this evidence is just not credible, which it isn’t. A fourth patient was having a long and complex treatment plan part of which had been incomplete and following a tooth fracture needed to be modified. The patient didn’t clearly understand the new treatment plan and for that our colleague was criticised. It’s worth mentioning that there were NO PATIENT RECORDS available because there had been a burglary declared immediately following the practice change of ownership. This was highlighted to the Panel. Communication was a big word in this Hearing. Other significant words are ‘insight’ and whether or not the Panel consider that this is ‘embedded’ sufficiently. Our young colleague was supported by Sir Peter Bottomley in person who made a statement and also by the testimonials of 47 patients. Do the GDC therefore need to apply Conditions, because that’s what they did? Please read the GDC Determination when it is published. If you recognise any of the issues above, you are guilty of misconduct and your standards will be deemed serious failings. Approximately 1 in 7 dentists in the UK currently face some form of investigation which could result in imposition of sanctions either through the GDC, CQC or NHS and this number is growing constantly. This might mean that we have the worst performing Dental Profession in the World bar none or that we have the most disproportionate Regulators. You may consider yourself lucky and are happy to cross the bridge with your indemnity organisation when your time comes; or you may be sufficiently confident to wade across the raging torrent alone when your indemnity organisation makes an unexpected discretionary decision against you. What type of indemnity organisation are you currently paying for? How can it be legal? You are required to have professional indemnity and it is considered a serious failure if you have ANY gaps in your cover period. Indemnity providers however do not guarantee to provide legal representation to you and if they exercise their discretion in favour of their balance sheet (or dressed up as other members interests) you will find yourself alone or facing a huge legal bill. A recent Hearing which I attended over 7 days starts at £32,000 and it’s uphill from there. Does anything need to be done about this? What exactly have we learned about whistleblowing from the Sir Robert Francis Report (Mid Staffs)? You tell me, do you need to do something about this? · The GDC consider failure to use a rubber dam in endodontics to fall seriously below the required standards and therefore to represent IMPAIRMENT and worthy of sanctions. · In my view neither the CQC nor the GDC have a currently correct understanding of CONSENT which conforms with the recent Supreme Court judgement of Montgomery – v Lanarkshire Health Board. This needs to be challenged in the High Court. · The GDC will always use the ‘balance of probability’ in forming an opinion on which evidence it prefers. So where are we going in 2016? The Profession must for once in its life join together. The issues regarding Consent and use of rubber dam will need to be challenged and this requires more than a well-intentioned individual or some crowd funding. It requires a strongly actioned move being taken by the BDA and the indemnity providers. Image credit -Michael Coghlan under CC licence - not modified. Complaints were rare. The GDC were a body to whom one looked up in awe and respect, and yet who played little part in day to day practice. Indemnity was low cost as was the ARF. At some point in one’s career one would make the decision to up the standards of ones work and seek to change the way one practiced. It was a cycle of professional life. Meetings [long before CPD became a fashion statement] were a cacophony of chit chat about practice matters. So what on earth has happened? How do we find ourselves at the edge of a perfect storm of change for the worse? The GDC are a runaway train of high cost complaints handling and we are all paying through the nose and other orifices too, I should think. 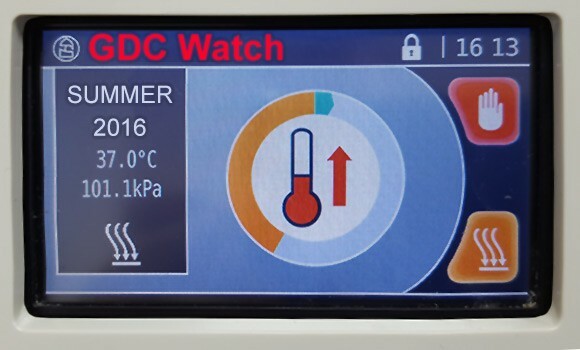 The persistent arrogance and lack of accountability of the GDC and its leadership remain a real cause for concern. A worry in part because they affect us but we do seem to be able to affect them, nor can the PSA, it seems. Just look at Indemnity as an example. On the one hand it is a significant chunk of income on an annual basis, now being compulsory [so the lawyers can REALLY get their teeth into you]. On the other hand, despite reassurances, there is a pervasive sensation that they will dig you out of a shallow pit of excrement, but if you are truly up to your neck they may simply leave you to flounder. A worry in part because they affect us but we cannot affect them. Now we have news of the falling away of dentist incomes. In a separate and apposite piece of Government news, even that respected statistical body HSCIC, thinks morale is a worry amongst dentists. Now incomes falling is hardly news because most of us have noticed this in the last 5 years. How? Well, we run these efficient Micro-Businesses, Minister and produce the annual accounts. Practice Plan’s latest Confidence Monitor is hardly an advert for happy campers under the Governments clinical cosh that is the UDA. The vast majority of the NHS dependent sector must be feeling very uneasy. What has caused this change of circumstance? Why are all the pointers suddenly running the wrong way? If morale is a precarious state of mind, all this news must surely cause the spiral of decline to turn more quickly unless something is done? Can morale fall, like the rain, in stair-rods? Now hold on Dr Prism … Dentists are a resilient bunch – we get by, we generally don’t moan, and we take the rough with the smooth because, let’s face it, there are many worse off than us and despite what the Daily Fail et al may say, we do have a social conscience. In our day to day work, we [you me and all the other GDPs] take personal responsibility for our situation. It is up to us to be happy … or not as the case may be. It is up to us to run our businesses. All good so far. But for the bigger external problems we rely upon an external body to do our work for us. We reply upon our Academic colleagues to lay out the ground for evidence based clinical practice. Not some random bunch of Red Braces in Wimpole Street who would not know a dental practice if it hit them on the head! We rely upon a representative body to keep the bad news at bay – to fight off the bad guys as it were. Where are the BDA as our ‘Union’? Perhaps they themselves experiencing a decline in morale as time and again they fail to make an impact against the onslaught of Government regulation and initiative? Not so long ago there was the change of subscription system and I seem to recall there was a ‘bit of a fuss’. Even on a professional matter such as obesity and the sugar debate, it was the medical fraternity that snatched the victory, and the BDA were left to issue a “told you so” PR statement which barely caused a public ripple. Perhaps the lesson of influence here was that we need strategic alliances to amplify our voice and our influence. Why is the BDA so effective on so many levels of “back office” matters and yet on the “Front Line” of headline influence and involvement, it is abjectly falling short. Why is it that as a body of 20000 dentists, they are neither first to be thought of in the media domain nor are they regarded with respect by our political masters? Incomes … the UDA system … the Prototypes … the CQC … the GDC and its quisling Dental members … the GDC and it expansionist ambitions … FtP … more FtP … Professional Morale … a vision for UK dental care … Children’s Dental Health … Young dentists and early training... Planning for Tiers ... the list goes on where as members [and non-members] we cry out for some serious bloody Bolshiness – and time and again we feel they fall short. Too busy having ‘polite meetings’? You might say that, but I could not possibly comment. So if the NHS GDP is the poor bloody infantry, who are their Generals? Well certainly not the new CDO, ironically Colonel [Retired], who is happy to discuss the present and future problems on the same stage as the very man who was their architect, now relishing his role as a non–exec director for a leading Corporate. The sign of poor morale in an organisation can be its collective ineffectiveness of leadership. 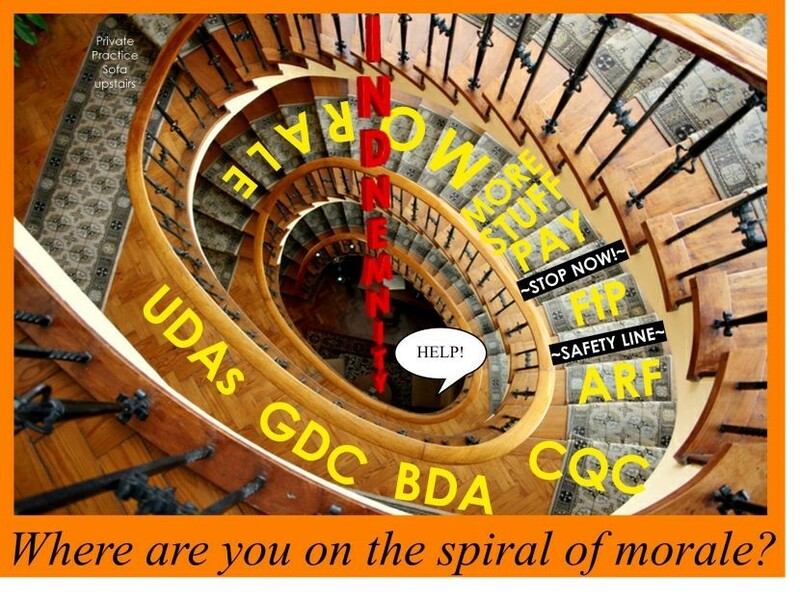 Perhaps the problem of spiralling morale in GDPs is in part due to a perception of low morale at the BDA? For sure as profession we need a dose of Feelgood Salts and a good kick where it hurts. The BDA need to start scoring some goals. It’s not like the ball is not in the open, and for sure the net is wide open. The NHS GDP needs its leaders, its “Generals”, to start doing more than limply waving a PR flag. I suspect members would prefer one action over the hundred words of a glossy Press Release. Can it really be a year since we and the BDA all went up in arms over the ARF change? A fine campaign of action but has 2015 seen it followed through?… It’s a sad reflection that, as no doubt predicted by Madame Gilvarry and Dr Moyes, the ARF is now seen as small beer – have you looked at your Indemnity bill? Start earning your members fees. Before a large part of the profession withers under your watchful gaze. The signs are out there. How many more hints do you need? Readers may or may not have experienced the delights of going on a cruise. So how does a voyage on a Dental Cruise sound? You join your ship with lots of other passengers and set sail. What is vitally important though is that you’ve been told before you sail you have to provide your own lifejacket. You notice that there are quite a few different sorts and colours. Some are ones that only inflate whilst you have them with you, and some are inflated all the time, even when you get off the ship at the end of your journey. Some passengers even have special coloured expensive ones that some of the lifejacket manufacturers don’t even supply. We’ll come back to those later. The industry is getting bigger and bigger, so more and more life belts have to be made for all those going cruising. Initially it’s all really nice, the food’s ok, and the accommodation is too. However, there’s something not quite right. The crew seem to be openly hostile to you, and the officers never seem to speak. The captain of the ship and the 1st officer never come down to speak to the passengers. You’re actually suspicious that the direction the ship is headed isn’t the one you signed up for. Not all the islands you visit are as welcoming as others. After a couple of ports you also start to see the numbers of passengers dwindling a bit and you hear a lot of splashes at night. You do a little research and you find out that the crew is in better quarters than you are, and your money has gone to pay for that. You have to tip the crew more and more even though the service is rubbish, and then you find out the way they worked out the tips was illegal. More worryingly you hear that the captain orders the crew to round up passengers who might be a danger to those who live on the islands the ship has visited or might visit yet. The captain orders the islanders to report anything they don’t like about the passengers to the bridge. The captain also allows spies to be put ashore to trap some passengers if the locals themselves don’t report the things that are done ashore. Passengers who have committed some sort of infraction are invited to visit the Bridge for a tour. Its not an option. You hear rumours that some of the officers don’t speak as the 1st officer has ordered their tongues cut out, possibly to prevent mutiny. You laugh at this, but you start to get a bit worried. You realize the crew doesn’t trust the passengers at all. Some of the passengers even report other passengers, or get the islanders to report them, or even join the crew. Then you see why the passenger numbers are dwindling. Every night, the crew makes those passengers who’ve had the bridge visit walk the plank. They are allowed to take their lifejackets though. Sometimes the crew let the passengers off before they get to the plank, although there isn’t always consistency as to who will be let off or not. Some even get halfway down the plank before they are allowed to come back. Usually that’s because the lifejacket manufacturers send their best machinists and repairers to make sure of the buoyancy of the jacket whilst its owner is on the plank. This costs the manufacturers lots of money, so it’s better if the lifebelts never get used in the first place. But you’ve already paid for the service when you bought the lifejacket. Most of those that do fall off the plank therefore obviously have their lifejackets to help them. These keep them afloat until the rescue boat picks them up and puts them back on the ship. Sometimes some are thrown overboard before the captain has heard the case and they might be allowed back on board, or they might be put ashore until the case has been heard, then they get to walk the plank all over again. However, there’s a problem with some of the lifejackets. Not all of them are going to work. Most do, but not all. Any you might be wearing one that isn’t going to work when you need it. Now some of this is because the passenger has done something so bad that Mercenaries employed by the crew are allowed to puncture the lifebelt. Some of these passengers drown or swim to shore, but either way they never get back on board. Occasionally the crew or even a mercenary punctures a lifebelt through their own incompetence and hope they don’t get found out. The lifejacket repairers sometimes throw a spare lifejacket to them. But sometimes the sharks get them first. But sometimes its because the maker of the lifebelt has decided not to put the flotation device in a lifebelt because of something you’ve told them or you’ve walked the plank before. It looks the same, and you certainly paid the same for it, but its only when you try to use it that you realize its not working. Remember those with the special coloured expensive lifebelts? They’re really expensive because the normal lifejacket makers wont supply normal ones to these passengers because they keep being made to walk the plank, or just keep jumping overboard because they do stupid things and don’t seem to learn from it. In fact, some of the lifejacket makers wont supply them at all but don’t always say why. Strangely, some of these passengers seem to arrive at the ship in fast cars and occupy the biggest and best passenger suites. Occasionally there are times when a passenger is walking the plank and the manufacturer of the lifebelt actually takes it off them, either just before they walk, when they’re in the water, or when they get back on board having survived the ordeal. The rules say passengers can’t stay on the ship without a lifejacket, but they now can’t get one to fit, the manufacturer wont sell them another, or they don’t have enough holiday cash left to buy another one. They either have to stowaway for which the penalty is immediate plank walking, or they have to get off at the next port. The captain no longer answers to the ships owners, but they don’t seem bothered, and the captain and 1st officer decide they’re going to expand their little seafaring enterprise as a result. There’s a ship right behind with loads of passengers that go ashore and always paint the islands white and harm the natives, and occasionally the captain makes one of them walk a plank, but doesn’t seem that bothered by the harm they’re doing. They don’t have any lifebelts on that ship either. 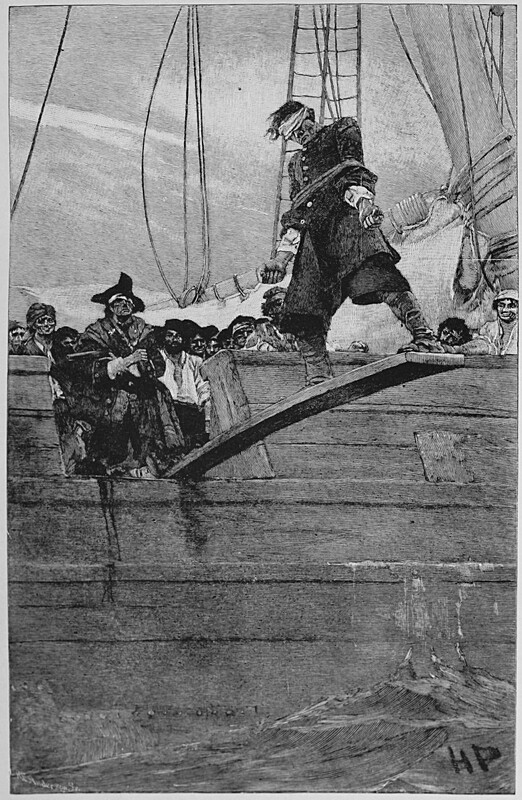 The passengers frequently get together and talk to one another, but no-one ever has the bravery to arrange a passenger mutiny even though they keep having the cost of the planks added to their tips. Most of the passengers are too busy trying to protect themselves to look out for the others. The senior officers of the crew don’t talk to one another as they haven’t any tongues, and those passengers that become part of the crew and can still talk don’t want to resign as they say they’re the ones that keep the bridge visits and plank walking fair. The happiest are the mercenaries that get to puncture the lifebelts as they get a bonus especially if they can make it take longer. The manufacturers seem to want to really only give the lifebelts to those that will never use them as they don’t have to spend money readying them for plank walking or repairing the punctures. But their top repairers are happy because they get paid more when they have a puncture to repair. What a silly story…. No one in their right mind would get on that ship if they read that, or stay on it a moment longer than they possibly could once they found out what was happening. Read Part 2 of this blog by clicking here. 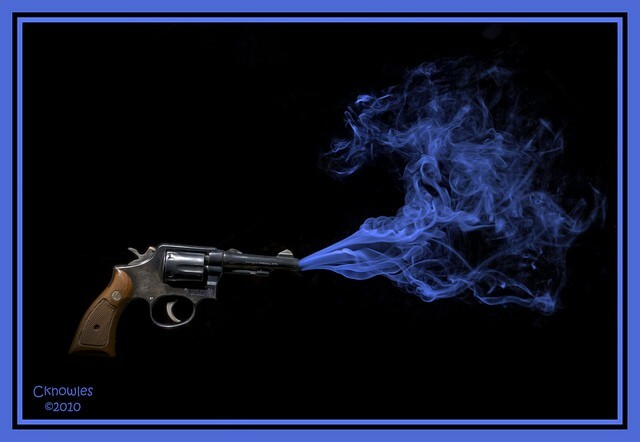 The Hired Gun with a smoking gun…. We all know the GDC has spent the last few years on its own little self-righteous planet, and even given its recent pitiful showing in front of the Health Select Committee there appears to be no sign they are planning to return to normality in the near future. Indeed, this week, what can only really be described as damning evidence of the GDC’s utter and complete contempt for the process of Justice in its most fundamental form has been revealed. A case in front of the Professional Conduct Committee this week has revealed that it is not only the initial stages of the disciplinary process that are woefully inadequate which resulted in their huge backlog of cases; but that the basic legal requirement of full disclosure of the case against a registrant may be riddled with horrific inefficiency and contempt for the fundamental tenets of justice. Not only that, the GDC is not following the rules set out for its registrants and flagrantly flouting them in order to pursue its own agenda of what now appears to be a persecution of the profession via its individual registrants. The PCC themselves described it as an ‘Offence to Justice’. With the facts that have come out about the way this case has been handled, the GDC has now plumbed new depths it seems. I didn’t think we could be treated with any more contempt that we already were; but this is jaw-droppingly bad. By what definition do the GDC expect us to have fair trial if they don’t submit the evidence as per the rules? They fail by their own standards throughout this case. Where is their duty of candour? Where is their transparency in their dealings with the registrant? Have they actually read the Human Rights act? I refer them particularly to Article 6, the right to a fair hearing, which quite obviously would not have occurred in this case had it not been for the integrity and the strength of the members of the PCC. For the PCC to accuse the GDC of being egregious (or outstandingly bad) is an extremely strong and unusual stance for them to take. Whilst this occasionally happens in the criminal and civil courts when a judge or jury might take exception to the conduct of one of the sides, for a committee funded by one of the sides to effectively take a swipe at its paymaster is highly unusual. I know the PCC is made up of independent members, but don’t forget, despite this independence, they are funded by the prosecuting side, the GDC. I am not for one minute casting any doubt on the integrity of any of the members of these panels, and in this particular case nothing could be further from the truth. But one has to wonder how much of a culture of fear is being instilled that pervades throughout any process the GDC is remotely associated with including these committees. How many other cases have been similarly dealt with by the GDC and the PCC not spoken up in the same way? We know now that this is an organization that doesn’t seem to apply the rules of law and justice properly to those it pursues, and even think these rules don’t apply to itself, and then show no insight whatsoever into its failings. Even the GDC solicitor involved in the case appeared to have had an inappropriate contact (not contemporaneously noted incidentally!) with the patient witness in order to ask leading questions and to coach them which also a big no-no. Just as strident but more worryingly to my eye is the criticism the GDC’s expert witness comes in for at the hands of the committee. I have not seen this amount of criticism of the expert in any case before. It almost seems like he has gone out of his way to act as some sort of private investigator in order to help the GDC secure its desired conviction. There have been a couple of cases recently where the GDC’s expert witness has come in for criticism, but not to this degree. Expert Witnesses are required to be independent and objective. It is an enormously privileged position to be in as they alone are allowed to give opinion-based evidence to a court and not just statements of fact. They are not and should never be seen as a Hired Gun to destroy the defendant. For whatever reason it would appear that in this case the expert has gone beyond his remit in such a way that one could seriously question that if this were a civil or criminal case whether serious charges against him would be the result of such a deviation from the accepted role. All the expert witness training I’ve done (and I’ve done a lot) has stressed the importance of never being a Hired Gun. I’ve had solicitors request I change parts of my reports to better serve their cases; and the answer has always been an immediate refusal. An expert witness has a duty to the court and to no-one else. We are not Magnum PI no matter how much we might want to be. But by acting as a hired gun, this expert has now turned this case into a smoking gun. 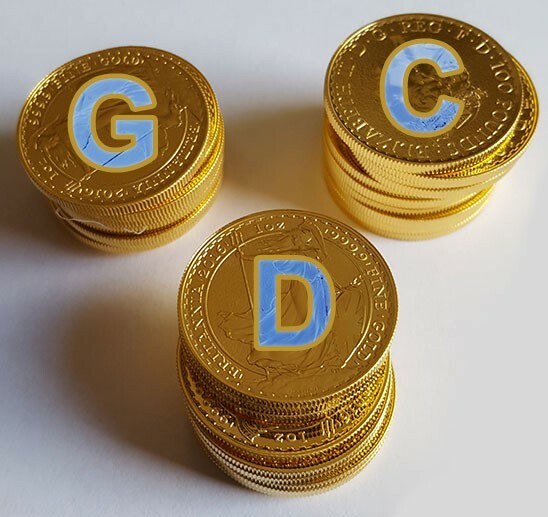 Experts are no longer immune from prosecution, and given the evidence in this case, one has to wonder if the abuse of process by the GDC and its expert means that this should now be taken further by the defence team in order to recoup their costs. Ironically, the expert could well be professionally covered by the same indemnifier involved in the defence, but then I’d have thought that might be an appropriate time for any discretionary support for the expert to be withdrawn since it appears he acted in such an unusual manner. Its also rather hypocritical of an expert who appears to be acting far outside his remit to feel he can stand in judgment of a practitioner who may or may not be acting outside his sphere of expertise. 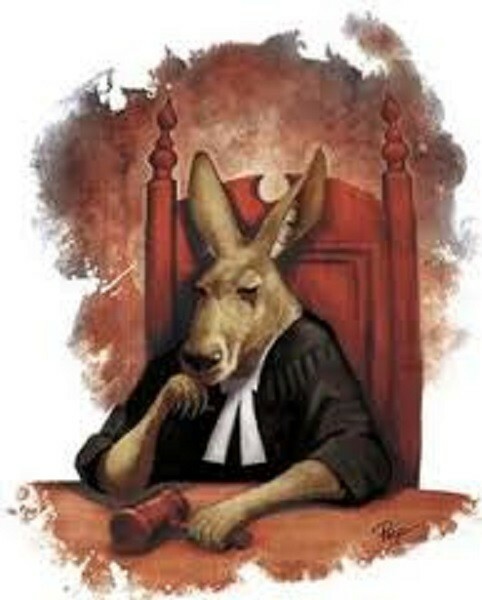 Unfortunately Expert Witnesses are not regulated in any way other than by their profession; but this behavior has to be close to bringing the ‘profession’ of expert witnesses into disrepute. I know a good many experts who are aghast at the revelations in this case. I’m sure the acquitted practitioner will probably now want the whole thing to go away, but I really hope that he doesn’t take this lying down; the GDC should be massively on the back foot with this revelation, and the profession’s moral (and legal) advantage should be well and truly rammed home now. The BDA should also now get very vocally involved again, and if they don’t they are going to miss a huge opportunity. If they approach it through lobbying MP’s they should broadcast this loudly to the profession so we can hear their voice. Some have said they should call for a complete halt to the GDC investigating process; but this would leave the public open to the risk of any truly dangerous individual being left free to practice. However, in my opinion they should press for every case both this expert and this particular GDC team been involved in to now be independently reopened, re-examined and all at the cost of the GDC. The costs of this should then be made exceptional from the annual GDC budget so they cannot then charge the profession for this. I’m sure they’ve got some indemnity insurance kicking around somewhere they can use. In addition, every pending case that involves just a single patient complaint should be now be suspended until a full independent inquiry (and I don’t mean by some equally flawed organisation like KPMG) into the above cases has been completed. There should be full and complete disclosure, and compensation paid to any registrants if the GDC are found to be in the wrong. Any employees of the GDC found to be in breach should feel the full weight of any legal process, and not be allowed to hide behind the corporate protection of Wimpole Street. Resignations of individuals at the GDC are no longer enough for confidence to be restored in our regulator. The profession should demand the highest powers possible now decide their fate. Whether this should be up to individuals crowd sourcing an opinion from a barrister as to whether the GDC are breaching our human rights; or our indemnifiers taking their own legal action to seek redress for the expenses incurred in cases like the above; and whether the Health Select Committee recall the GDC Executive to be given the coup de grace; or the BDA continue their lobbying of MPs whilst we keep filling those same MP’s mail sacks with letters. It needs to be all of the above and simultaneously. We need to unleash a veritable storm that cannot be ignored. Enough is enough. We need to keep taking firm action. Is the entire profession listening? It’s time to hit back again.